The first day of class is Aug. 28, 2012. Please see the DeCal page for more information and feel free to let us know if you have any questions. The course syllabus and course control numbers will be distributed on the first day of class. This site is under construction. The information above is correct and up to date (as of August 24, 2012). Feel free to browse this site, but any specific information might be out of date. What is the "Israeli Dance DeCal?" The DeCal program at UC Berkeley evolved out of the Free Speech Movement. DeCal stands for Democratic Education at Cal. Students develop curricula, work with faculty sponsors, and run classes. DeCal courses are worth actual university units, good for the 120 unit graduation requirement or for meeting a semesterly unit minimum. For more information, see DeCal.org. The Israeli Dance DeCal course has been in existance at least since Spring 1997 (that's the oldest documentation we have). It began as Dramatic Arts 98, under the guidance of Jenefer Johnson, but then bounced around different departments. In Spring 2007, it left Anthropology to find its current home in the Jewish Studies department, with faculty advisor Professor Miryam B. Sas. In Spring 2008, Aaron Alpert developed an additional curriculum for students to earn 2 units instead of just 1. Today the course is offered with a 1 or 2 unit option. For more information for prospective students, see the About or Enrollment pages. More information about what Israeli Dance is can be found on the History page. Israeli Dance is practiced all over the world, including 3 weekly sessions and 2 monthly events in the Bay Area. The DeCal is reaching out to the larger dance community! Our 2 unit students are required to attend at least Israeli Dance event outside UC Berkeley, and we regularly invite the community to our semiannual Marathon. 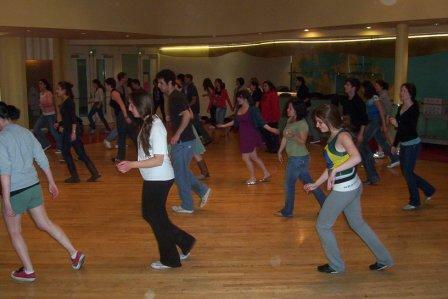 This semester, we will continue Café Hillel, our own monthly dance evening. More Quesitons not Answered on this Website? The Contact page has information about how to get to know us.